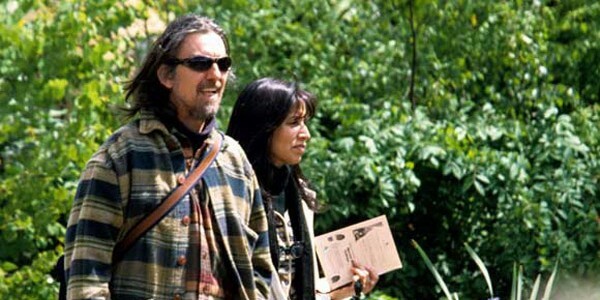 It was Olivia, George Harrison’s wife, who introduced me to George, and son, Dhani. We spoke on the phone over a period of two months before she extended an invitation to me to come to Friar Park. I drove around the back of the property and engaged the intercom as she had instructed. “I’m here!” she said, in a busy, yet friendly, voice, and the gate opened. Driving down the winding road leading from the back of the estate to the mansion, I drove past George, initially mistaking him for one of his gardeners. He looked a lot like he did on the cover of “All Things Must Pass,” though older and a bit grayer—♫ hair . . . down . . . to his knees ♪—he was ♪ groovin’ up slowly ♫ in gumboots—as if he had been pruning the hydrangeas. 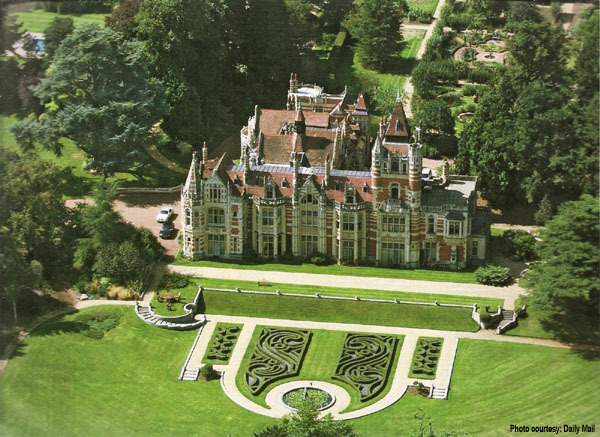 Aerial view of Friar Park and its meticulous grounds. 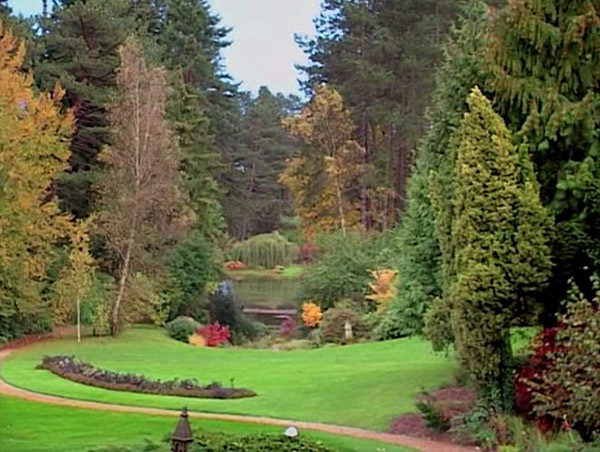 Over decades, George had invested significant resources restoring the famous gardens at Friar Park. At one time, George employed a botanist and ten gardeners. His two brothers, Peter and Harry, were also employed to work the estate. But no one worked the gardens more than George. He loved getting outside, planting, and digging in the soil, often working by moonlight; he cherished his gardens. Today, under Olivia’s careful maintenance, the landscaping at Friar Park remains amazing—better than it was when Sir Frankie Crisp owned the property in the early twentieth century. Section of Friar Park’s world-class landscaping. When I drove up to the mansion during that first visit, a staff member received me in the parking area. I was escorted through a large, black wooden door and instructed to wait in the foyer. Through a high window, I saw shadows lurking outside, inspecting my vehicle. 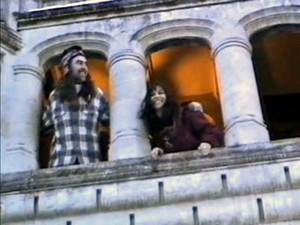 Then Olivia appeared, beautiful and smiling, with Dhani. I met George a little later, in what can only be referred to as a near death experience, as described in Within Me Without Me. “Your home in Heaven is more wonderful,” came a swift inner reply. 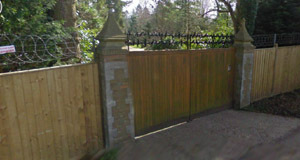 Back gate at Friar Park. I didn’t mind the wait but I thought it best to inform George and Olivia sooner rather than later about the reluctant gate—before they settled down for the night somewhere deep inside their 120 room Gothic estate. I phoned them from my car and left a message on an answering machine. I waited about five minutes for a return call, then U-turned and headed back. I pressed a black button, outside near a door in the courtyard, and VOOSH! VOOSH!—blinding stadium lights ignited the sky—they loomed like the mother spaceship in the film, Close Encounters of the Third Kind—invaginating me from on high. A voice that sounded like a somber George called down from above, through the light, within the darkness, between the columns of a balcony, “Yes?” the voice inquired. I stuck my thumb up in the air and was on my way. Courtyard balcony where George & Olivia spoke within the light and darkness. I can’t explain why I took a right where Olivia instructed left. The road narrowed rather quickly. It got darker away from the manor and, like a cliche, English fog rolled over the car, making it very difficult to see. This can’t be right, I thought. The road turned out to be more like a path. Evergreens scoured the car. Tree limbs and plant life brushed so tightly against the sides, I couldn’t turn the car around. A little further and I’ll find an opening and get back, I thought, slightly panicked. The path suddenly vanished. I had no idea what new surface I was driving on but it was slick enough to cause the car to fishtail. The wheels were losing traction and I started really really freaking out, then I realized: “Oh my God! I’m driving a car over George Harrison’s world-class garden!” Visions of exotic plants being flung into the air from under my car tormented my mind—divots of kirengeshoma, shreds of jasmine and Japanese anemones, beautiful magenta blooms from zebrensis— my tires spinning faster— chewing up rare ferns at warp speed. I furiously challenged the car’s transmission, refused to be caught destroying George Harrison’s lawn, begged the Almighty for freedom—”GOD! PLEASE!” I cried. “JESUS! SON OF DAVID! HAVE MERCY ON ME!”—plowing deeper—making mud mousse out of the meticulous greenery. Why did I let God have it? Because (a) He knew how important my relationship to the Harrisons meant to me (b) I knew He heard my anguished pleas because He had answered me only a few minutes earlier when I was waiting at the gate (c) I knew He had the power to release the car from the bog and yet He chose to abandon me instead. But God knew something I didn’t know. Read the stunning Beatleriffic conclusion of this story at We’re Not That Spooky. Jeff – I called on everything i had learned on the farm. Nothing. Speaking of that Bug, i remember one day you and i were in the backseat and Dad was driving, minding his own business, and you whispered to me, “Watch this.” Then you started whistling. Less than a minute later Dad was upfront in a world all his own whistling. When he stopped, you started again, and about 30 seconds later, he was whistling again.hahaha. That might have been my first lesson in parental psychology.hahaha. That was fun times for sure. Wayne. I would have died. When George passed away a group of us from church drove from Surrey to Oxfordshire to pay our respects at Friar Park. We placed flowers on the gate and prayed. It was peaceful. Very good story by the way.